These pretty filigreed silver colored barrettes have red stones around a single rhinestone on each one. They come with a Certificate of Authenticity from Estate of Rue. Happy Valentine’s Day! 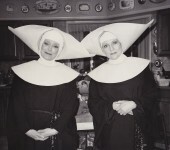 Remember when Rue and Betty played nuns on that hurricane episode of “The Golden Girls?” Well, turns out it was good practice for later years when Rue would play a nun in many “Nunsense” productions – and if you haven’t seen them they are hilarious. She loved working with the show’s creator, Danny Goggin, and was always willing to say ‘yes’ when he called for the next sequel. We found Rue’s “Nunsense 2″ coat in the hall closet of her Manhattan apartment and there was a terrible error on it. Monogramed on the front was “The Reu” instead of “The Rue!” I was so embarrassed for Mr. Goggin, I mean, he runs such a professional organization I couldn’t believe they would make such a silly mistake. I called him to ask what the heck had happened – he just returned from a production of “Nunsense” at the Muny in St. Louis for over 5,000 people, so I’m sure he really wanted to hear me calling to complain about monograming – and he said, “Um, it isn’t “The Reu” it is “The Rev,” with a v, because she played the Reverend Mother and everyone called her “The Rev.” Why isn’t there a reverse button in real life? So, here is Rue’s coat and I am still a dork! Comes with prints of the photos shown, one of Rue’s copies of the DVD, and a Certificate of Authenticity. Of course, Rue hung on to the dress and earrings she wore to the Primetime Emmy Awards in 1987, and she also hung on to the Emmy Award she took home that magical night for “Outstanding Lead Actress in a Comedy Series.” All three items are part of this package and they come with an 8 1/2” x 11” framed glossy photograph of Rue in the dress, wearing the earrings, and holding her Emmy. See clip here: http://www.youtube.com/watch?v=_1g7oY1Xw-g (Rue was miffed Howie mispronounced her name – twice!). This is another piece from that archeologist/jewelry designer that Rue loved to collect. Do you see those double strands of black beads? Well, a few of them have become single stands along the top of the necklace. We found 6 of the beads, which we will include, but the necklace doesn’t seem to be falling apart or need to be restrung. Perhaps it was just shut in the lid of Rue’s jewelry case or something like that. Anyway, this necklace is 24″ long and comes with a Certificate of Authenticity from Estate of Rue. We found this old notebook in a stack of Rue’s papers at the bottom of one of her file cabinets in the home office of her Manhattan apartment. The first thing we noticed is the coffee splatter marks on the cover and that let us know it was DEFINITELY Rue McClanahan’s! Before the old notebook hit the trashcan someone opened it up and just look at what was discovered – it is a treasure chest with over half a dozen of Rue’s “doodles” inside. If we had to assign levels to Rue’s “doodles” we’d have to say this notebook has a couple minor ones, a couple more that are pretty good examples of her work, and three that are unquestionably MAJOR! All the “doodles” are worthy of framing, even some of the little sketches in pencil, but that will be up to you. We were going to break the thing up and do the framing ourselves, but we decided to keep the piece intact, just as we found it. 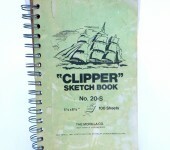 Rue’s “doodle” notebook comes with a Certificate of Authenticity from Estate of Rue. Did you know Rue made about 70 movies in her lifetime? In fact, many of those made are now shown on the Lifetime Chanel, but that is neither here nor there. 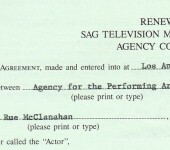 Anyway, since she made movies for both theatrical release and for television, she had to execute contracts for each type. This original 8.5″ x 11″ 2-page agreement, with one page being 2-sided, is for movies she made to be shown on television. Like the other agreements Rue entered into as professional actress, since she incorporated herself, she always had to have a “Corporate Rider” to her contracts; this rider basically said as corporate president she was binding herself as the actress to the agreement – weird, eh? Not only did the corporation save Rue a lot of money in taxes and give her a way to write her hair appointments off on her tax returns, but it resulted in her agreements having THREE ORIGINAL SIGNATURES! This original contract with three of Rue’s original signatures comes with an 8″ x 10″ headshot taken during that time period and a Certificate of Authenticity from Estate of Rue. This is an amazing piece! Is it a necklace? Is it a piece of sculpture? Rue wore it as a piece of jewelry, but it really could sit on one’s desk or a shelf in any shape you wanted. Through ingenious design, the piece has this ability to hold any shape you put it into. Rue’s metal necklace/sculpture measures 36″ long and it is a tad over .25″ thick. The piece will come with a Certificate of Authenticity from Estate of Rue.